A perfect addition for your new Wendy Anne Moses basket. Wendy Anne’s 100% organic jersey fabric is the perfect combination for a snuggly Cozy Baby Moses basket that is delicate and natural for baby's skin. 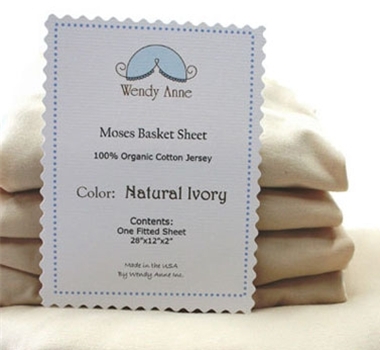 These sheets are 100% organic cotton jersey in Natural Ivory. Please allow 2 weeks for processing in addition to shipping.